Oh, the many delicious facets of Halloween. While adults may spend days deciding how to spend their Halloween night (costume party? haunt? trick or treat chaperone? ), most kids can immediately tell you what their plans entail: collecting and devouring as much candy as humanly possible. We at 365 Halloween fall into a small minority when it comes to our candy policy; we don’t give any out. Yes, we’re the hippie neighbors that many kids scowl at while watching fruit strips, boxes of raisins, and stickers plop into their candy sacks. But one peek into those bulging bags of sugar and we know they won’t miss one mini Snickers bar. On average, most Americans consume 142 pounds of sugar per year, and given the scientific data on sugar consumption and the symptoms everyone can feel for themselves, we’d rather focus on other aspects of Halloween and give out healthy treats. Since other Halloweenies out there in Interwebland have already plunged head first into this season’s newest candies, we’ll leave the reviews to them. X-Entertainment has a 2 part series, and as usual, Matt never disappoints. I-Mockery reviews over 30 varieties of candy which is a whopping 3 pages long. Your afternoon is spent if you sit down for these 2 entire articles. For a shorter read with some fun animations, Jason has written his personal thoughts on this year’s haul. What are your thoughts on giving out candy for Halloween? Do you give out the usual treats, opt for something healthier, give out non-edibles, or give nothing at all? We’re definitely going to have an article about low-sugar alternatives to passing out candy, so check back for that in a few days. 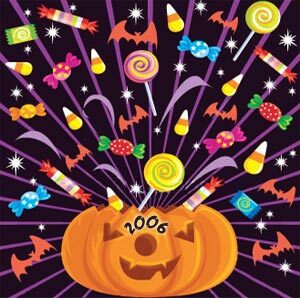 Subscribe to comments with RSS or TrackBack to 'New Halloween Candy'. I find that ‘trick or treaters’ are happy with alternative healthy treats. I helped design a healthy halloween tips web page on this subject with printable healthy Halloween treat ideas, recipes, and safety tips. Fruit strips, Halloween stickers, temporary tattoos, packs of roasted pumpkin seeds, snack packs of graham crackers, fig newtons, water bottles and juice boxes are a great treat ideas too. Another fun idea is to have a Halloween party instead of trick or treating (game ideas- bob for apples, pin the face on the ‘jack o’ lantern’, sponge paint decorate t- shirts). One of my favorite games is: make a string maze with different colored string and have each kid follow the string to get a healthy treat. I really also enjoyed the recipes and ideas on your website. Happy Healthy Halloween! Those are excellent ideas. That’s a good point, too; non-edibles are unexpected, and can be more exciting than *just another piece of candy*. Thanks for the ideas! My house does the same thing but we hand out small toys and other non-edibles. We notice that children are more excited by the finger puppets, noise makers, and wobble heads we give out than the normal candy given by the neighbors.